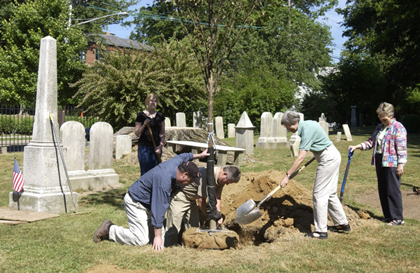 RETURNING TO ITS ROOTS: A three-year-old Princeton American Elm was planted in Princeton Cemetery Thursday just two months after its stately 278-year-old ancestor succumbed to Dutch Elm Disease. The new tree, near the corner of Wiggins and Witherspoon streets, comes from a long line of elms known for their resistance to the devastating disease. An independent study examining the efficacy and quality of the Princeton Township Police Department sent a not-so-veiled message to Township Committee Monday: the force could be cut back. The developer and general contractor of Princeton Borough's downtown development project, Nassau HKT Associates (NHKT), has brought on a new financial partner to mobilize the project that has, in essence, stalled since hitting some logistical snares. The cemetery might be the last place you would expect to find new life in Princeton, but that's exactly where it is.